Focus on the details: The 3-diopter frameless lens provides a 175% magnification paired with over 6 watts of bright cool white light brings fine print or small details back into sharp, clear, focus. Easily adjustable: When mounted to a desk or bench with the heavy-duty clamp, fine-tune the angle of the lamp with the built-in ball joint, swivel head, and the 32" articulated arms, which all allow custom adjustment. Our frameless crystal clear edge-to-edge lens provides unbelievable clarity without the weight of those larger and bulky lamps. 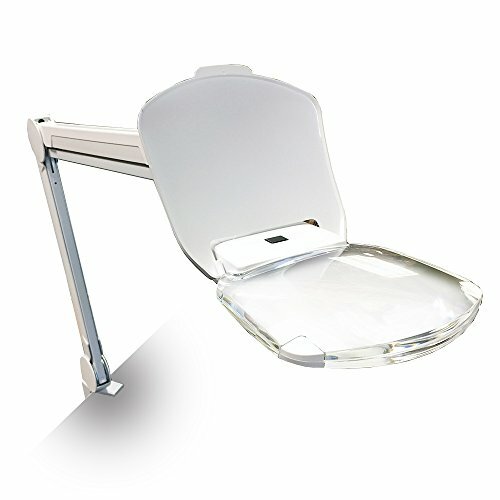 Perfect for uses where a heavy glass lens is is difficult to maneuver or use. 6 Watts: Save money on power usage with the low consumption LED light with over 500 lumens of bright cool white light. Protect the lens from dust with the protective flip-up cover. If you have any questions about this product by Quantum Precision, contact us by completing and submitting the form below. If you are looking for a specif part number, please include it with your message.